BioFluidiX’ TopSpot® microarray printers allow you to print nanoliter arrays of up to 96 different liquids in parallel. TopSpot® - the ideal solution for your diagnostics product manufacturing. BioFluidix offers three types of single channel dispensers that work in the range from several picoliters up to the microliter range. 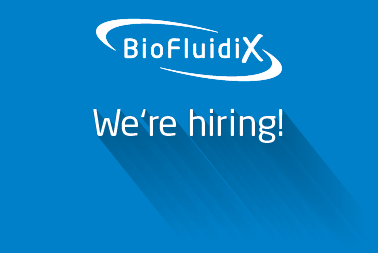 BioFluidix provides everything you need to miniaturize your dispensing applications. BioSpot® workstations are the perfect automation platform for your dispensing applications based on our single channel and microarray products and can be equipped to your needs with up to 12 dispensing channels as well as optical process control features. Intelligent dispenser calibration based on droplet imaging! The PipeJet® and SiJet technology enables the contact-free dosage of small amounts of liquids in the range from a few picoliters up to hundreds of nanoliters. 3D Bioprinting enabling artifical cardiac valve printing. BioFluidix has established and applies a Quality Management System for development and manufacturing of dosing technologies which has been successfully certified by TÜV SÜD according to ISO 9001 in August 2014.